Awhile back I registered on marthastewart.com and signed up for a few of her e-newsletters. I don't always buy into everything about the "martha" lifestyle, but I think she has got some sweet ideas and a lot of great resources. Last week, Martha delivered a hefty fix for my current organizing obsession. As I said a few weeks ago, I can't paint anything or tear out my bathroom right now, so I have been cleaning and organizing like a mad woman, succumbing to my crazy mama hormones. My basement is practically color coordinated, my files drawer is obsessively organized, and last week I swept, vacuumed AND washed all of my wood floors. So imagine the thrill when last week's MS email appeared in my inbox with the subject, "Spring Cleaning Solutions" and it was only Week 1 of this fabulous segment. Yay! Everything from cleaning out your medicine cabinet to rotating your mattress. There should be plenty of cleaning bliss to keep me busy for the next few weeks. 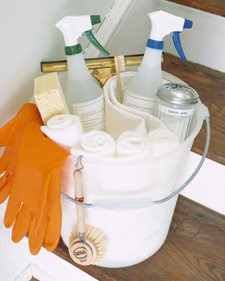 Even great resources like a basic cleaning kit and a spring cleaning checklist. So, if you need a little inspiration or you have your own obsession to feed, head over to Martha's house.